The Maker's Diet, sometimes called the Maker Diet, is a holistic approach to health, addressing healthy habits in the physical, spiritual, and emotional realm. While not specifically geared toward weight loss, it has the effect, when followed as written, of a reasonable amount of weight reduction, while improving overall health and well-being. Jordan Rubin was a very sick young man, so sick that friends and family were certain he was about to die. After starting college at the age of 17, Jordan began to experience baffling health problems. This led him on a four-year tour of traditional and alternative medicine, which he lost hope with because no cures for his illnesses were found. Forced to abandon his education as his health deteriorated, Jordan was suffering from candidiasis, Entamoeba histolyica, cryptosporidiosis, pre-diabetes (and its accompanying circulatory problems), Crohn's disease, compromised liver function (evidenced by jaundice), insomnia, endocarditis, inflammation of the eyes, anemia, arthritis, leukocytosis, and malabsorption syndrome, among other medical conditions. Jordan took a trip to California to visit one last specialist -- an "eccentric" nutritionist who believed that Jordan's problems were the result of his eating habits: Jordan was critically ill because he was not eating the diet indicated by the Bible. What happened next would radically change Jordan's life. Jordan's new eating regimen included kefir, a product from fermented raw cow's and goat's milk, along with organic, free-range meats, poultry, and eggs. In addition, ocean-caught wild fish, yeast-free sprouted grain breads, raw nuts and seeds, organic fruits and vegetables, raw sauerkraut, and other naturally fermented foods were included. Then Jordan's father sent him "a bag of black powder" -- homeostatic soil organisms, or HSOs. After adding the HSOs to the biblical diet, Jordan's health took a significant turn for the better. In forty days, he regained 29 pounds; he had weighed 111 pounds when he started the regimen. As his health continued to improve, Jordan, always interested in natural health care, began to research and discovered other lifestyle habits that had been affecting his health. Improper hygiene, inadequate exposure to sunlight, lack of sleep and staying up past midnight, consumption of artificial sweeteners, excessive use of medications (both prescription and over-the-counter), inadequate mastication of food, and many other factors contributed to Jordan's ill-health -- and, he is convinced, these factors contribute to the widespread ill-health suffered by many people in the world today. Foods allowed on The Maker Diet plan are those that fall into the dietary guidelines found in the Old Testament. Animal meats must come from creatures that have split hooves and that chew the cud. Pork is forbidden. Poultry must be non-scavenging birds, such as turkey, chicken, duck, or guineas; ostrich and emu are not allowed. Chicken and duck eggs are allowed. Seafood must have fins and scales; no catfish or shark, and no shellfish. Dairy products made from cow, goat, or sheep's milk are permitted. The Maker's Diet is a forty-day, three-phase total lifestyle makeover. There are three levels: basic, intermediate, and advanced, depending on your state of health, time allotment, and budget. Information on the basic level is provided below. This is a complex program, so purchase of the book and supplemental materials is highly recommended. Phase One: Phase one lasts for fourteen days. During this phase, high-starch foods such as potatoes, beans, pasta, bread, and legumes are avoided, along with sugar and dairy products. Organic, grass-fed meats, free-range poultry, and wild fish are allowed, as are most vegetables, nuts and seeds, berries and citrus fruits, certain fats and oils, and honey as a sweetener. A hygiene program called "Clenzology" is to be followed morning and evening, along with morning and evening prayer, morning and evening exercise, vitamin supplementation, and a strict bedtime of 10:30 p.m. In addition, one day a week is a "partial fast day," in which breakfast and lunch are omitted and only an evening dinner is eaten. Phase Two: The next fourteen days continue the lifestyle makeover, reintroducing a number of foods to the diet and continuing the healthy lifestyle habits of phase one. Certain dairy products may be added to the menu, along with peanut oil, certain beans and legumes, a number of fruits, and stevia (sweet herb, a natural sugar substitute). Phase Three: The final phase of the forty-day plan continues to build on the previous stages. Additional nuts, seeds, beans, and legumes may be added to the diet, along with additional fruits, grains, and maple syrup for sweetening. The other lifestyle changes are continued. On the basic level of the diet, certain dietary supplements are added to the meals and lifestyle changes. A living multivitamin with homeostatic nutrients is taken three times daily. Icelandic cod liver oil is taken in the evening; the amount taken is based on weekly sunlight exposure. The basic level of the Maker's Diet has been described above. In the intermediate level, morning and evening cleansing drinks are added. In the advanced level, aromatherapy is added, as is a "purification" supplement taken twice daily. It is impossible to adequately describe the full Maker's Diet program without reproducing the book. All of the research and rationale behind the program, along with sources for the specialized products, are included in the book, which is fully indexed and contains detailed endnotes. The appendices will be invaluable, as they contain numerous recipes and extensive information on product suppliers. The daily regimens are spelled out in detail, so it is important that you buy the book if you wish to follow this plan correctly. The book is widely available at bookstores or at Amazon. The basic diet is one characterized by excellent nutrition, with ample quantities of vegetables, fruits, proteins, and other healthful foods. Processed and refined foods are discouraged, as are the "unclean" foods of the Bible. Surprisingly, the restrictions do not adversely affect the variety of foods available for consumption -- while there are a few forbidden foods, these are rare, and by the end of the 40-day period, you are eating nearly everything you ate before. 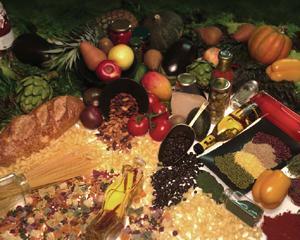 Quantity is reduced, as your body regains health and vitality and as you overcome poor lifestyle habits.